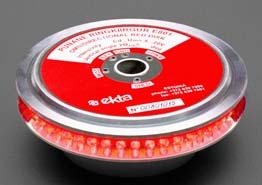 The E80x family includes four LED disc light sources with the outer diameter of 130mm (132mm including the optional lens) for application within a 150mm cupola: E801 - red, E802 - yellow, E803 - green, E804 - white. In addition, the blue version is available soon. Narrow vertical divergence version (8°, with optional UV-stable acryllic lens, E80x.1 models) - higher light intensity in focal plane. To provide optimal results as required by particular application, the power and vertical divergence options can be mixed as necessary. The discs are designed to be controlled by the Disc Flasher E864 and are intended for different types of marine lanterns - as buoy lights (E807), on moorings, and in other fixed lights (for example, E805). 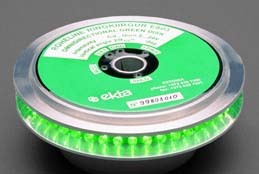 To extend the visibility range of a navigation light, several E80x LED discs can be mounted lego-style as a column (stacked) within one lantern. Layout and dimensions of the LED-disc source E801.